SLMA Week: Why is there so much lip service and so little action in Marketing ROI Reporting? Is there really a marketing ROI? Ruth P. Steven's tells the truth!" This is a replay of a show that is evergreen. The problem still exists.How do you weigh in on it? Why aren't more marketers skilled enough to prove the ROI for lead generation (or branding for that matter). 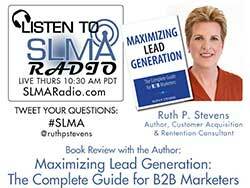 Author Ruth P. Stevens is interviewed on August 13, 2015, 10:30 Pacific time by SLMA Radio Host Jim Obermayer about her book Maximizing Lead Generation. We will discuss her step by step lead generation recommendations, see if the top media options have changed in the time since the book was published and if her predictions on the ways lead generation is going to evolve has started to come true. List Price: $44.95 Que $26.99 Amazon: $15.85 Also available as a Kindle book. Ruth P. Stevens consults on customer acquisition and retention, teaches marketing at business schools in the U.S. and abroad, and is a contributor to HBR.org, AdAge, Biznology and Target Marketing Magazine. Crain's BtoB magazine named Ruth one of the 100 Most Influential People in Business Marketing. Her newest book is B2B Data-Driven Marketing: Sources, Uses, Results. She is also the author of Maximizing Lead Generation: The Complete Guide for B2B Marketers, andTrade Show and Event Marketing, and co-author of the white paper series, "B-to-B Database Marketing." Ruth is a director of the HIMMS Media Group and the Business Information Industry Association. She also serves as a mentor to fledgling companies at the ERA business accelerator in New York City. She is past chair of the DMA Business-to-Business Council, and past president of the Direct Marketing Club of New York. Ruth has held senior marketing positions at Time Warner, Ziff-Davis, and IBM and holds an MBA from Columbia University. Learn more at www.ruthstevens.com.